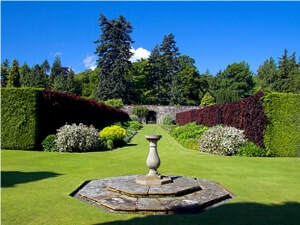 Kailzie Gardens are situated 4 miles from Innerleithen on the B7062, off the tranquil back road between Innerleithen and Peebles. Apart from the gardens, principal attractions for a day out include live viewing of the Tweed Valley ospreys (Easter to end of August), the restaurant (which re-opened under new management at the end of February 2010) a gift shop, Children's Corner, putting green and a picnic area. You can follow their progress of the Osprey Watch live on camera from Easter until the end of August, along with many other smaller species on live nest camera screens. Bait and fly fishing are available on the two ponds. Information indcluding corporate and club visits, please call 01721 729020. They also have a private two mile stretch on the River Tweed for fly fishing (for enquiries or booking call 01721 720009). In the summer months many people choose Kailzie and the restaurant as a venue for their wedding. Open 7 days a week throughout the year. Winter - End of October to March, Wild Garden and Woodland Walks only, during daylight hours.